TG is pleased to inform you that The Darkness have announced a proper, actual, tour of the UK and Ireland, due to kick off this November. Having dipped their toe in the water with the past week of warm-up shows and having made a triumphant return in front of a massive crowd at Download festival, The Darkness have unveiled 17 headline shows that will take place throughout the UK and Ireland this winter. 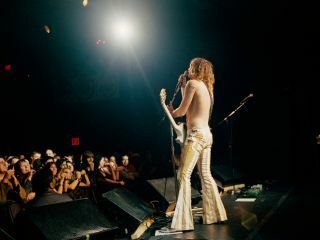 Justin Hawkins has also recently confirmed that the band's newly recorded third studio album will be out around the same time, though a specific release date has not yet been confirmed. Tickets will be available from livenation.com and will go on sale this Friday (17 June) at 9am. Head to thedarknessareback.com for more information.